Chef Tom Kerridge says serving with the warmly spiced Mexican beans, they make a relaxed breakfast-meets-lunch dish. The dish features in Tom’s cookbook, Fresh Start, out now and published by Bloomsbury Absolute. For the beans, heat the oil over a medium heat. Add the onion for two mins, then add garlic. Sprinkle in the spices, stir for a min, add tinned tomatoes, kidney beans and water. Simmer for 15 mins. For the corn cakes, preheat the oven to 140C/Fan 120C/Gas 1. Put sweetcorn kernels, spring onions, cheese, flour, cornflour, salt and pepper into a bowl and combine. Separate the yolks and whites into two bowls. Add milk to yolks, beat well, then pour in the corn mixture and mix. Whisk the whites to soft peaks, then gently fold into the corn mix. Cook the corn cakes in batches. Heat a little oil in a non-stick pan. When hot, drop 3 or 4 tbsps of the mix into the pan. Cook for 2-3 minutes until bubbles appear on the surface, then flip and cook for 2-3 minutes on the other side. Make about 20 cakes in total. Just before serving, gently reheat the beans. 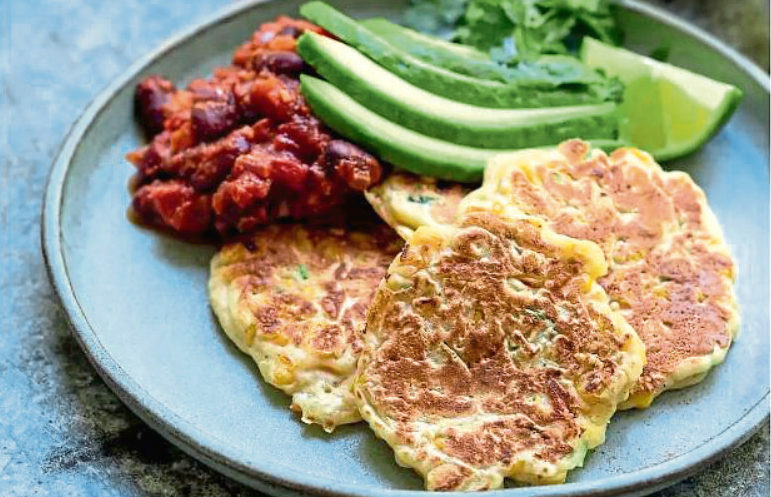 Serve with the corn cakes, avocado slices, lime wedges and fresh coriander.